1 To make the gnocchi, put the potatoes in a medium saucepan. Cover with cold water and season with a good pinch of salt. Bring the water to a low boil and cook the potatoes for about 20 minutes, until very tender but not breaking apart; make sure they are completely cooked. 2 Drain the potatoes and spread on a baking sheet. Split in two to release their steam. This allows more water to evaporate and will make them easier to work with, and render your gnocchi fluffier. When they are cool enough to handle, gently peel off and discard the skins and mash the flesh (preferably using a potato ricer). Spread the potato onto a work surface and leave to cool completely. 3 Gather the cooled potato into a mound and make a well in the centre. Put the beaten whole egg and yolk, and olive oil into the well and season with the salt. Place the flour and parmesan around the outside of the potato and, using a fork, gradually mix all the ingredients to form a smooth dough. Once it has come together, knead the dough for 4-5 minutes, just to work the flour through. Form the dough into a short, fat sausage. 4 Bring a large pan of salted water to the boil. Lightly flour a clean surface and cut the dough into quarters. Roll each quarter into a longer sausage shape, about 1cm in diameter. Work along the lines of dough, pinching it every 1.5cm or so, and then cut off each gnocchi with a sharp knife so you have lots of small pillow shapes. 5 Cook the gnocchi in batches in the boiling water. They will sink at first, then rise to the top when they are cooked. Remove with a slotted spoon and set aside in a warm serving dish. 6 For the sauce, gently melt the butter in a sauté pan. Add the sage leaves and allow them to cook for a minute to infuse the butter. 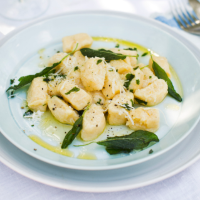 Toss the gnocchi in the sauce to really coat them, season with the additional parmesan and some freshly ground black pepper, then serve immediately. Recipe extracted and adapted from The Tucci Table by Stanley Tucci.